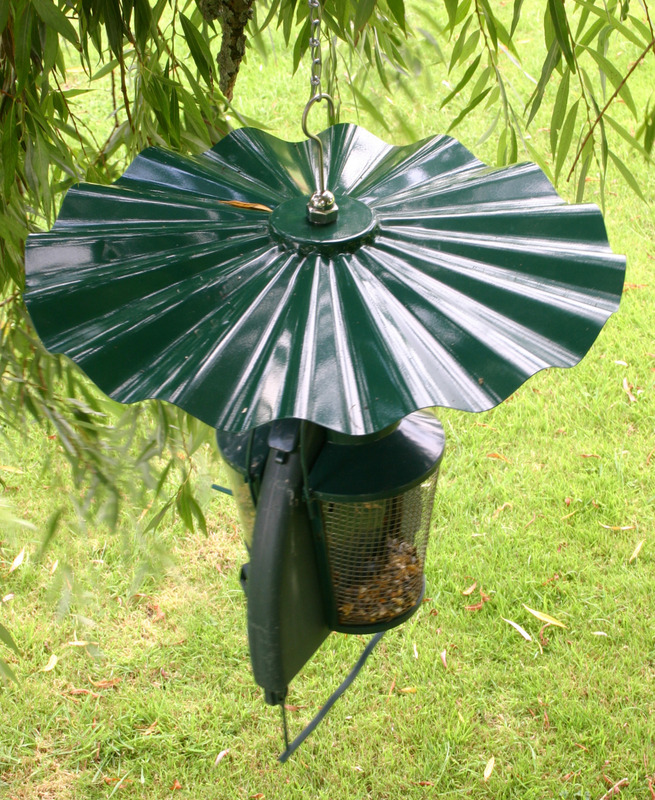 Deter those pesky squirrels from climbing up or down onto any of your feeders. These metal baffles outfox even the most cunny squirrel! Drinker and feeder pictured is sold separately. "I first bought a Quill Bird Feeder about three years ago, followed by another a year or so later. They have brought an amazing variety of birds into my garden – in every season! The design is ideal, making it convenient for small birds to feed, while making it impossible for bigger birds to get access to the cleverly-designed feeding compartments. They also appreciate the bird-drinking nozzles, while bigger birds can pick up the seeds which are dropped on the garden below. Squirrels were a problem at first, but the Squirrel Baffle really does work: after a few unsuccessful attempts to get at the nuts, the squirrels just give up and go away. The seeds are more popular than the nuts, but, recently, a great spotted woodpecker has become a daily visitor, eating the nuts while hanging, often upside-down, from the front of the feeder. Another result of having so many birds in the garden is the much reduced number of slugs and snails this year! Both of my existing feeders have now gone through a number of hard winters and are looking a bit weathered. I should be giving them a good clean, but the price is so reasonable that I have decided to get two new ones to replace them."